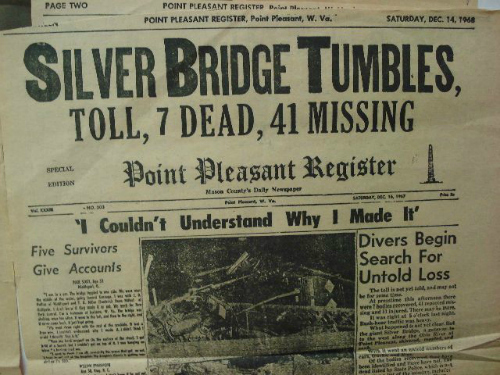 “I lived in Ohio at the time the Silver Bridge fell that linked Point Pleasant, West Virginia to Gallipolis, Ohio. I lived outside the town of Racine, Ohio which is about 25 miles away from where the bridge fell. I was just 10 years old at the time and everyone from many counties from both Ohio and West Virginia were in shock. It was a very cold night in December and many on the bridge were not only people coming home from work but those who had been out Christmas shopping as well. The Ohio River was so cold, it may have had ice on it. Not to mention the snow on the ground. I saw an oddity but, being a town girl, thought it was a normal event. Until now. Several years ago, I was driving out to my rural property, which required that I drive on a somewhat blind curve. Upon doing do, I had to brake for a couple of huge black birds. The wingspan of each took up more than a lane of traffic. They were each about the size of a Cessna. They were so heavy that I had to wait a bit until their huge bodies could get airborne. Having been to a "birds of prey" event beforehand, I recognized that these birds had no feathers on their heads, so were carrion-eaters such as vultures. Also, they were eating remains of something dead in the road. I continued on, and when my yard work was done, I drove home and they had returned. Nothing seemed out out of the ordinary at the time. Years later, my community (Henry, IL) was being visited by vultures: a flock by the barge-loading dock at the IL river, and a flock about a block from my house in a really large pine tree. One late afternoon, I looked out and saw a vulture in my driveway, and attempted to get a photo. This bird took off as quick as a robin- UNLIKE my huge birds from before. I did an online search and was to find out that the turkey vulture is the largest bird of prey. This is what was in my driveway- tiny compared to what I'd seen. I too have experienced this mist/haze on this bridge. We sat and watched it outside of the car. It was center of the hood. Didn't take it long to move in my direction. The cloud came in the car window and went straight down my throat. My friend witnessed it. If he didn't see it himself, he wouldn't have believed it. He since has passed on. I know what I experienced that night. I know I'm not crazy! What the hell happened to me that night in 1990. The Crybaby Bridge is located near Westminster, MD (Carroll County) on Adams Mill Rd. The local legends attributed to this particular bridge range from a young woman who became pregnant and was afraid to tell her family to the location being used by the KKK to drown black babies in the 1800s. I have an encounter to report that I thought you might find interesting, as it happened in PA. I grew up in a suburb of Erie, on a busy road about 1/4 mile from the shores of Lake Erie. Although our house fronted the road, the other three sides of it were rimmed with thick woods, giving it the feel of a country house. I was ten years old at the time, so this would have been almost 50 years ago. Some time in the middle of the night I was awoken by the sound of tapping on my bedroom window, which was closed. I looked over at the window and could see the dark outline of someone or something with its face very close to the window. It seemed to be looking at me. I dove under the covers in terror, telling myself that it was a bad dream and that I should wake up. Only it wasn't a dream, and I was awake. Whatever was outside my window continued its occasional knocking for several minutes, and then the knocking became a little louder and more persistent. I couldn't make sense of what was happening, because my bedroom was on the second floor, and I did not have a balcony. How could someone be standing outside my second story window?! I came to the only logical conclusion I could muster -- it had to be a witch. To my ten-year-old brain, nothing else could hover in mid-air other than a witch. After what seemed like an eternity but was probably only a few minutes, I bolted upright in bed and screamed at it to leave, then dove back under the covers. In those brief few seconds that I faced it, I could see that it had a very pale, almost white expressionless face, two beady round dark eyes, with no obvious nose or mouth. Picture a white smiley face with two black dots for eyes, but no smiling mouth. It sure didn't look a witch, but that was the only explanation that made sense to me at that time. I don't know how long I waited under the covers, but it felt like an eternity. The knocking stopped, and when I finally got the nerve to look at the window again, it was gone. I told my parents about it the next morning, and of course they told me it was a dream. I knew without a doubt that it wasn't. Over the years I've scoured the internet, looking for stories of similar encounters. To be honest, the stories that strike me in my gut as the most similar are those of large bird/people. Since you have received numerous reports recently of large flying cryptids in the Chicago area, I thought there may be a Great Lakes connection. Who knows? Life truly is stranger than fiction. Ogopogo: A Cousin of Nessie? UFO BOMBSHELL: Could this memo solve Roswell 'flying saucer' crash mystery?